SAN DIEGO (AP) — Jumbo squid have arrived in Southern California waters and are being caught by sport anglers by the hundreds. U-T San Diego reported that on Jan. 6, fishermen just 4 miles off Oceanside reeled in 200 Humboldt squid. The squid were first spotted on the surface a few days ago, and a boat captain told the newspaper they are scattered from the Mexican border to Dana Point. 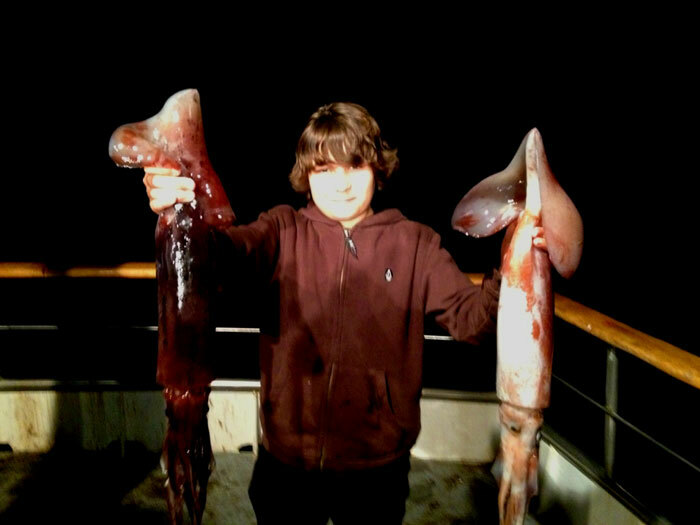 On the same day, Dana Wharf Sportfishing in Dana Point reported that anglers aboard two boats caught about 800 squid in only 45 minutes, just 2 miles out of the harbor. The squid are feeding on an abundance of krill that has come into the region’s water from tidal flows, and they are typically at or near the surface when it’s dark. Humboldt squid is also called “jumbo squid” or “jumbo flying squid.” The species squirts ink to protect itself.